Treatment to control involuntary body movements characteristic of Parkinson’s disease could someday be guided by brain signals recorded by electrodes inside a fashionable hat. That is a piece of a larger goal in the research of Nicole Swann of the UO’s Department of Human Physiology. She’s the lead author of a newly published study in the Journal of Neural Engineering that, she said, offers encouragement to pursue that notion. In the study, done while Swann was a postdoctoral researcher at the University of California, San Francisco, researchers adjusted levels of deep-brain stimulation in real time based on brain signaling captured by electrode probes attached to a device surgically implanted just under the skulls of two patients. The approach also delivered energy savings for the battery-powered device. 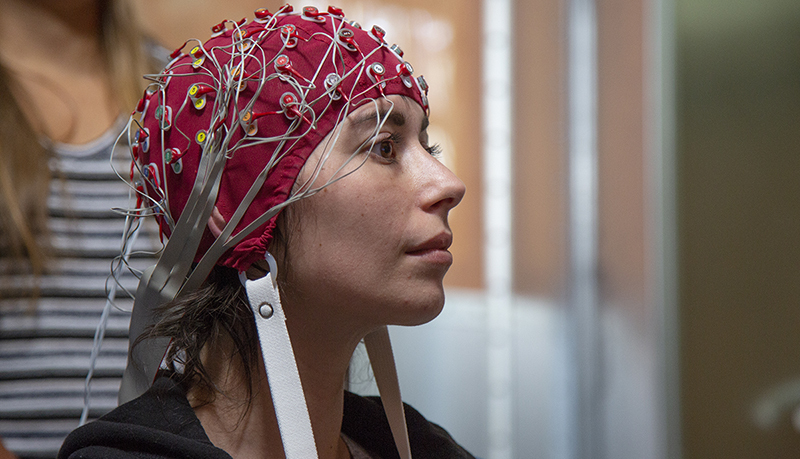 In her UO lab, Swann is seeking to use electroencephalography, commonly known as EEG, to capture and understand brain signaling related to body movement in healthy people and in those with brain diseases such as Parkinson's, in which dyskinesia, or involuntary body movements, is one visible and disturbing side effect. Deep-brain stimulation was approved for treating essential tremor, another movement disorder, in 1997 and for Parkinson’s disease in 2002. "Deep-brain stimulation has been a standard FDA-approved therapy for movement disorders since the 1990s. It works well, but with limitations," Swann said. "Today's devices are much like cardiac pacemakers were a long time ago. When pacemakers first came out they just delivered stimulation, but now they are tuned to sense abnormal heart rhythms and only deliver stimulation when it is needed. This adaptation of the stimulation is the advance we are trying to make with brain stimulation." Current devices deliver electrical stimulation at a set level determined by trial-and-error tests to find a setting that best controls patient's symptoms. Settings are adjusted using a remote-control device over a battery pack, which is implanted in the upper chest of patients and connected to the probes under the skull by wires running under the skin of the neck. Replacing batteries requires surgery to access the battery pack. Swann’s team used a device made by Medtronic Inc. capable of recording brain signals that could be used in real time to automatically raise or lower stimulation levels. Neither patient, males in their 60s diagnosed with Parkinson's seven and eight years earlier, reported feeling changes in stimulation. Energy savings of 39 percent and 45 percent were seen in the devices when using the adaptive algorithms. "Side effects of deep-brain stimulation can include increased dyskinesia as a result of too much voltage," Swann said. "The idea was to lower the voltage to reduce or stop these side effects and then increase voltage to give optimal therapy when the situation changed. We sought to hold the treatment in a sweet spot." The findings, Swann said, lay the groundwork for more complex algorithms to achieve that balance in improved versions of the device. Members of the UCSF team, including Swann, have recently published related papers in the Journal of Neurosurgery and Journal of Neuroscience. Initially, noninvasive EEG experiments in Swann's UO lab will focus on healthy people to study the brain regions associated with movements. Next, she'll recruit Parkinson's patients to look for altered body-movement signaling, including signals related to dyskinesia. 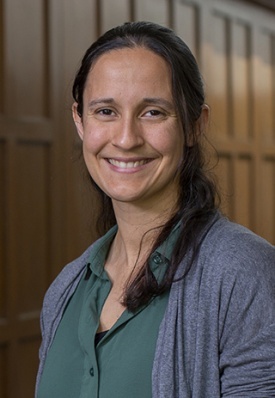 She also is working with surgeons at Oregon Health & Science University in Portland to obtain motor-related data from patients with a variety of neuro-related diseases using invasive human recordings. "One way to move forward is to use the information we gather to improve algorithms in devices like those we used in our study," Swann said. "We also imagine that, for some patients, having implanted electrodes may not be the best option. In the future, we might be able to use a EEG electrode placed in a fashionable cap to record data that could be used to inform changes in the settings." Such a cap, she said, also might also allow wireless trasmission of information from patients, especially those living in remote locations, to neurologists who could tweak medications also being used in treatments. The UCSF project was primarily funded by the National Institutes of Health. Engineers at Medtronic reviewed the team’s paper for technical accuracy, but the company did not provide funding. UCSF has filed a preliminary patent on the adaptive device used in the research. Swann and study co-authors Coralie de Hemptinne, Dr. Philip A. Starr and Dr. Jill L. Ostrem, all of UCSF, and are listed as co-inventors.